These sanitary standards cover the material requirements of plastics for multiple-use as product contact and/or cleaning solution contact surfaces in equipment for production, processing, and handling of milk and milk product(s). Test criteria are provided for plastics as a means of determining their acceptance as to their ability to be cleaned and to receive effective bactericidal treatment and to maintain their essential functional properties and surface finish in accelerated use-simulating tests . These standards do not apply to plastics for single service application nor plastics which are of rubber or rubber-like origin resulting from chemical or thermal vulcanization or curing. 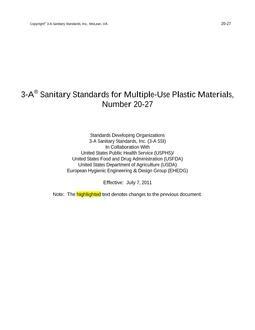 These standards are also not meant to cover design and fabrication criteria for individual plastic components, because such criteria are provided for in other 3-A Sanitary Standards and 3-A Accepted Practices.